I had a sudden flash of inspiration as we were counting out 50 used pods to be placed in our Eco-Pod recycling package. You only recycle 50 pods at a time and we had over 60. Why not create some Halloween decorations with the remaining baker’s dozen? A quick trip to the craft store and I had everything we needed. 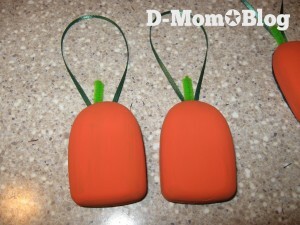 Following the same general steps as we did with our tree ornaments, I had a prototype in no time. The result? Spooky sPODers and PUMP-kins. Prep the pods by removing the adhesive pad, snipping cannula, and wiping with alcohol if the surface is not clean (we use baby oil during removal and it makes them slick). 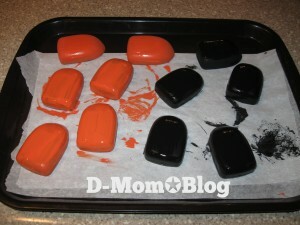 Apply two coats of acrylic paint using the foam brushes, letting them dry between coats. 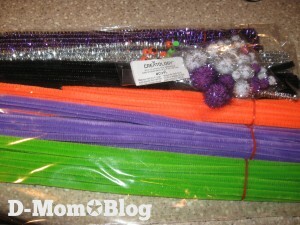 Cut equal lengths of ribbon if you want your decorations to have hangers. 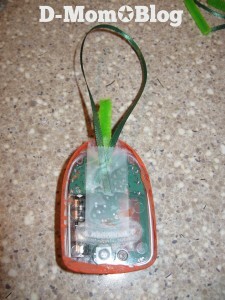 Loop the ribbon and attach to the back of the pod, securing with a piece of tape. 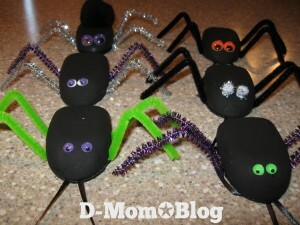 For the spiders, attach lengths of pipe cleaners using tape. 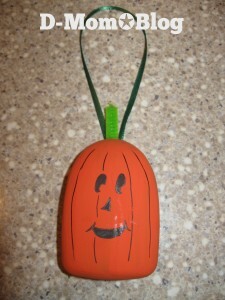 For the pumpkins, attach a small piece of green pipe cleaner at the top for the stem using tape. 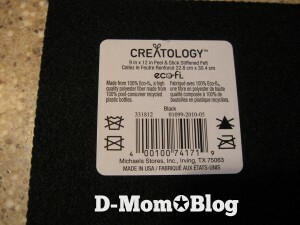 Remove backing and place felt on the back of the pod covering the ribbon loop and legs. For the spiders, glue eyes near the top of the pod where the window is. 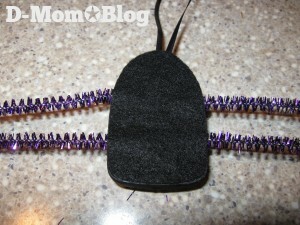 Optionally, glue a large black pompom for the spider’s body. 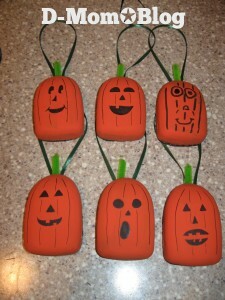 For the pumpkins, use a Sharpie to draw the facial features and vertical lines if desired. If you included the ribbon hanger on the decorations, you can hang them on windows using small suction cups or create a Halloween tree using a small Christmas tree. Insulet should hire me as Director of Crafting Creativity! If you make these decorations, please share them with us. Include a link to your blog post in the comments. 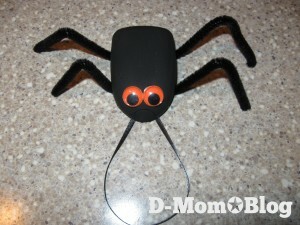 Additionally, send a photo to leighann (at) d-mom (dot) com and I will create a gallery of Halloween Pod Awesomeness. And if you blog about it, please link back to this tutorial. Much appreciated! Read more “Having Fun With Diabetes” posts. I’m sure an OmniPodder near you would gladly give up their stash! ha ha ha ha ha!!!!! That is SO CUTE! I’m so NOT crafty….but maybe I could pull one of these off 🙂 Great job! They’re awesome! They were pretty easy. If you look at the Christmas ornaments, you could do them even easier I think, decorating with stickers. First Christmas ornaments, now Halloween decorations. I think I need to start thinking about turkeys next! 28 isn’t too old to do this, is it? No, I don’t think so! I have tons of extra pods laying around, so why not? Great idea, fantastic photos, too! Thanks for sharing! Going to the craft store this weekend!! Awesome! I bought the brand of paint that was on sale for 50 cents, same with the ribbon. Very cute-I want to try some of them! This is so clever!! 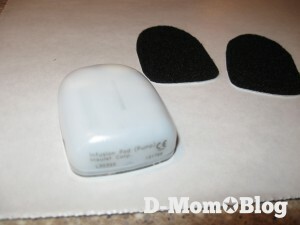 Kinda wish Jenna used Omnipods if for no other reason than the crafting possibilities. LOL!!! (I hope her Ping didn’t hear me say that. Shhh!) Love this Leighann! How cute and what a wonderful idea!! Awesome idea! I am so excited to show this to my daughter and see what we can come up with for Christmas with our used pods. Thanks! Finally got around to posting ours on November 8! Better late than never. We had fun.